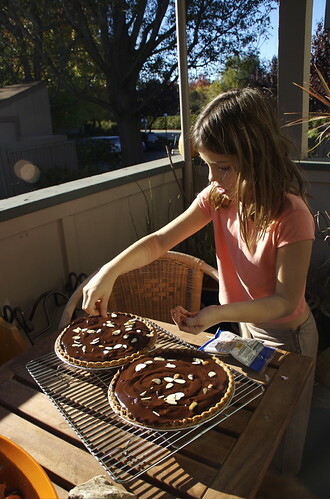 For Thanksgiving I made two Mazarine Pies. One to give to our upstairs neighbor who always graces us with an incredible platter of Ethiopian food on Thanksgiving day, and the other to bring to my sister-in-law’s. The first one made it to its destination without a hitch, the second got a good licking by one of our elderly dogs just before we headed out. Maybe it was a blessing in disguise… after cutting out the section that had had the chocolate cleared off, I discovered that my filling was much cakier (if that’s not a word, I’m declaring it one) than I’d intended it. So this morning I tried again, I couldn’t start my holiday season without a Mazarine Pie, could I? This time I made it without the chocolate topping and it rocks. Perfection if I do say so myself. And I do. Set out the puff pastry to defrost. Butter a glass pie pan. Coarsely grate the almond paste and butter. In a large bowl stir eggs, sugar, and extracts with a fork. Again with a fork, mix in the butter, and almond paste. When combined, add in the flour and baking powder. Mix until the flour clumps are incorporated — it’s totally ok, desired even, to have butter and almond paste clumps. Place one pastry sheet in the bottom of the pan. Lay second sheet over, and shape. Lower oven temp to 350 degrees. Cook for 30-40 minutes, until toothpick comes out clean. 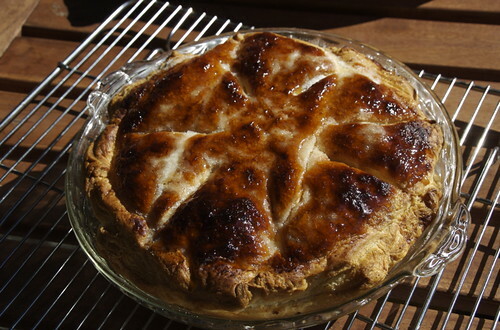 I sprinkle a good coat of sugar at this point and put my pie back in the oven until the sugar caramelizes — about 5 to ten minutes. Set out to cool so the caramel hardens. An alternate preparation for chocolate lovers is to bake without the top cover of pastry. After you’ve allowed your pie to cool, top with melted chocolate and garnish with almonds. Oh, I hear you. My cats have done the old “lick the food” to my stuff too. Real nice.